Robin came to us in the fall of 2006. Her mother was a stray who had been fed by my friend, an 82 year old lady. The mother cat kept having kittens whom she then brought around to my friend’s house. 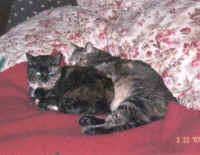 We were never able to get the mother, but we did manage to get the kitties of three of her litters and three of her babies who in turn came around and brought their babies - too many to keep track of, actually. 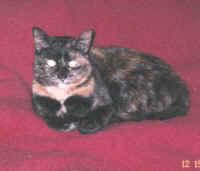 Robin was a beautiful torti, the only female who somehow managed not to get pregnant. Robin was a little magpie. She stole everything she could carry, pens, combs, pencils, nail clippers, you name it, she carried it off. She would systematically stick her little nose in my purse and take off with my pens - until I remembered to keep my purse zippered. Her markings in front looked like she was wearing a necklace with a pendant. Could never quite get a photo of that. She found a good home.